As long as it’s black and white apart from the covers. There was a time when British black and white reprints of american comics were seen as perfectly acceptable reading matter. But we still considered them pale imitations of the real thing. Now I’m surprised to see that there are comic fans in the USA who avidly seek out old British, Australian and South American reprint comics as an opportunity to see uncoloured Ditko or Kirby etc artwork in its original state. All the better to examine the detail of the linework I suppose. For me, the worst of all worlds was when the Annuals used that strange green and black or red and black duo colour artwork inside. When they did decide to colour the reprinted Marvel Comics stories in the UKs “Power Comics” Annuals of the late 1960s the results could be wildly unpredictable. The digital files of today must make such things a doddle, but in 1969 they evidentally only had black and white artwork to work with. The colourist had probably never seen, or even bothered to see an original US comic and relied on guesstimation rather than a detailed colour chart. Consequently the 1970 Pow Annual is the best place to visit if you’d like to see a red-garbed Fantastic Four and an almost-transparent Thing. Join me in my time machine as we spin back to the mid 1960s. I was ____ years old and along with buying all the Marvel/DC/Gold Key/Charlton/etc comics I could find I was also still buying our home grown fare. I had already graduated from the Beezer and the Beano to Valiant and Ranger when a new comic caught my eye. “Wham!” Comic was first published by Odhams in the UK in 1964 and was followed by “Smash!” in 1966 and “Pow!” in 1967. I see a theme here! Although the original idea for “Wham” was to be an answer to (and a more modern take on) DC Thompson’s Dandy and Beano in many ways it followed the same format as the Boy’s Papers of the time such as Lion, Tiger, Buster etc with a mixture of anarchic humour along with two page adventure stories. Admittedly the humour strips in “Wham!” were by Leo Baxendale and Ken Reid and set new standards of excellence. However a new twist was soon added. 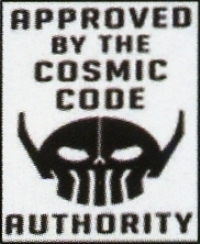 Black and white reprints of Marvel material were introduced. First “Wham!” began reprinting the Fantastic Four. “Smash!” soon contained the Incredible Hulk, and later had Batman on the cover (albeit reprints of the newspaper strip version rather than the regular DC version) whilst “Pow!” starred Spiderman and Nick Fury and others. To fit the Marvel stories into four page stories on the larger page size the individual panels were often shuffled about to make them fit in. UK sourced art was often inserted in and around the stories. Along with Spiderman and Sgt Fury Pow 13 contained a number of humour strips including Nobby’s Night Mares, The Group, Wee Willie Haggis, The Dolls of St Dominics (evidently a take on St Trinians) and Dare-a-day-Davy. This last strip was in colour on the back page and drawn by the unique Ken Reid. The adventure strips in this issue were Jack Magic and The Python. Now called “Power Comics”, Odhams decided to issue two more weekly comics. In a slightly smaller size somewhere in between the size of “Pow”and the american comics they were copying they launched “Fantastic!” and “Terrific!”. These two comics were almost entirely full of black and white reprints from Marvel, with The Avengers, X-Men, Iron Man, Thor etc with perhaps just a token UK story included. When sales declined it was usual for UK publishers to combine comics. Many weekly comics were delivered by newsagents along with daily newspapers. So when sales 0f “Wham!” began to tail off readers would suddenly find “Pow!” appearing unannounced through their letter box. Hopefully these new readers would stay with the “new” comic. One of my favourite features in this comic was “The Cloak”. Drawn by Mike Higgs in a most cartoony style it was funny and stylish and totally different to anything else in “Pow!”. If “The Cloak” had been published in more recent times it would have endless merchandising and perhaps even cartoons on TV. In the 1960s they either didn’t appreciate the possibilities or were just content to print the weekly comics. As it is “The Cloak” along with so many UK comic characters like Sgt Hurricane, The Spider, Alf Tupper, Wilson (perhaps there’ll be a future post about the bonkersness that was “The further truth about Wilson!”), Keyhole Kate, Grimly Fiendish, Brassneck, General Jumbo, Kelly’s Eye etc ad infinitum are lost in limbo whilst Superman and every other USA comic character you can think of from Uncle Sam to Krazy Kat never seem to have gone away. Eventually “Fantastic!” combined with “Terrific!”. By 1969 Odhams had sold out to the publishing conglomerate IPC and within a matter of weeks the “Power Comics” line was no more. “Smash!” was the sole survivor for a while but it no longer contained any Marvel material and had become just another identikit UK comic. The fact that UK comics until the 1970s were all newsprint including the covers is the main reason for the low survival rate of these fascinating artifacts.